Cells made by fusing a normal human muscle cell with a muscle cell from a person with Duchenne muscular dystrophy — a rare but fatal form of muscular dystrophy — were able to significantly improve muscle function when implanted into the muscles of a mouse model of the disease. The findings are reported by researchers from the University of Illinois at Chicago in Stem Cell Review and Reports. These cells, called "chimeric cells," are made by combining a normal donor cell containing a functioning copy of the gene for dystrophin — a structural muscle protein lacking in people with Duchenne muscular dystrophy — with a cell from a recipient with the disease. In a January 2018 paper in Stem Cell Reviews and Reports, the researchers used mouse donor and recipient cells to make chimeric cells that boosted dystrophin levels by 37 percent and improved muscle function when implanted into the muscles of a mouse model of Duchenne muscular dystrophy. The new cells had both donor and recipient characteristics and interacted with their surroundings like normal cells. The chimeric cells remained viable and produced dystrophin for 30 days. Now, the research group, led by Maria Siemionow MD, PhD, professor of orthopedic surgery in the UIC College of Medicine, report similar findings using human cells implanted in a mouse model of Duchenne muscular dystrophy. Siemionow: "Our results point to the long-term survival of these cells and helps establish the use of chimeric cells as a novel promising potential therapy for patients with Duchenne muscular dystrophy." Her team is looking forward to clinical trials in humans in the near future. People with the disease don't have the gene for dystrophin, a structural protein that helps keep muscle cells intact. Symptom onset is in early childhood, usually between ages 3 and 5. The disorder causes muscle weakness and loss of motor function and ultimately results in respiratory or cardiac failure and death. With advances in treatment, many with Duchenne muscular dystrophy live into their teens and 20s, and some into their 30s, but there is currently no cure for the disease. Promising treatments include gene therapy and stem cell therapy, but each has drawbacks. Gene therapy relies on delivering good copies of missing or dysfunctional genes to cells via viruses. Not only can cells become immune to viral infection, rendering the therapy ineffective, but there also is no guarantee that viruses will only infect the intended cells. Stem cell therapy, where cells that contain the dystrophin gene are implanted into a recipient, requires that the recipient take immunosuppressive drugs to prevent rejection. "This is not conventional stem cell therapy. We are restoring dystrophin in such a way that the recipient won't need to take anti-rejection therapy because the implanted chimeric cells can evade the recipient's immune system. In traditional stem cell therapy, the implanted cells are 100 percent 'other' and anti-rejection medicine is needed in order to prevent the host immune system from destroying those foreign cells." Maria Siemionow MD, PhD, Department of Surgery, Poznan University of Medical Sciences, Poznan, Poland; Professor of Orthopedic Surgery, University of Illinois at Chicago, Chicago, USA, and lead author of the paper. In contrast, chimeric cells are 50 percent 'self' — with many biochemical and genetic features of the recipient — and as such can trick the recipient's immune system into ignoring them. "The chimeric cells are just enough like the recipient's own cells that their immune system gives them a 'pass' so to speak," Siemionow explains. If such cells were to be used to treat a patient with Duchenne muscular dystrophy, then normal muscle cells from the recipient's father or close relative would be fused with muscle cells from the patient. Researchers fused muscle cells from patients with Duchenne muscular dystrophy with muscle cells from normal, healthy donors. In the lab, the chimeric cells were seen to express dystrophin. When the cells were implanted into the leg muscles of a mouse model of Duchenne muscular dystrophy, dystrophin levels rose approximately 20 percent of muscle fibers affected by the implanted cells at 90 days post-implantation, "enough to produce a significant improvement in muscle function." Krzysztof Siemionow MD, Assistant Professor of Orthopaedic Surgery and Neurosurgery, Chief of Spine Surgery, University of Illinois at Chicago, and a co-author on the paper. Duchenne Muscular Dystrophy (DMD) is a progressive and lethal disease caused by mutations of the dystrophin gene. Currently no cure exists. Stem cell therapies targeting DMD are challenged by limited engraftment and rejection despite the use of immunosuppression. There is an urgent need to introduce new stem cell-based therapies that exhibit low allogenic profiles and improved cell engraftment. 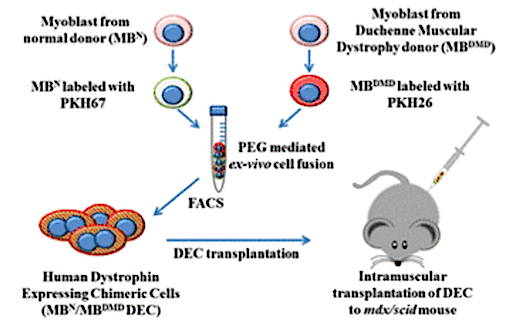 In this proof-of-concept study, we develop and test a new human stem cell-based approach to increase engraftment, limit rejection, and restore dystrophin expression in the mdx/scid mouse model of DMD. We introduce two Dystrophin Expressing Chimeric (DEC) cell lines created by ex vivo fusion of human myoblasts (MB) derived from two normal donors (MBN1/MBN2), and normal and DMD donors (MBN/MBDMD). The efficacy of fusion was confirmed by flow cytometry and confocal microscopy based on donor cell fluorescent labeling (PKH26/PKH67). In vitro, DEC displayed phenotype and genotype of donor parent cells, expressed dystrophin, and maintained proliferation and myogenic differentiation. In vivo, local delivery of both DEC lines (0.5 × 106) restored dystrophin expression (17.27%±8.05—MBN1/MBN2 and 23.79%±3.82—MBN/MBDMD) which correlated with significant improvement of muscle force, contraction and tolerance to fatigue at 90 days after DEC transplant to the gastrocnemius muscles (GM) of dystrophin-deficient mdx/scid mice. This study establishes DEC as a potential therapy for DMD and other types of muscular dystrophies. Authors: Erzsebet Szilagyi, Krzysztof Siemionow MD, Enza Marchese, Ahlke Heydemann and Joanna Cwykiel of the University of Illinois at Chicago, and Jesus Garcia of Saint Louis University, Missouri, are co-authors of the paper. This work was supported by the UIC Chancellor's Innovation Fund Proof of Concept Award. Krzysztof Siemionow MD is CEO and shareholder of Dystrogen Therapeutics SA, the company holds a license for DEC Therapy. Maria Siemionow MD, PhD is CMO and shareholder of Dystrogen Therapeutics SA, the company holds a license for DEC Therapy. The authors declare a potential conflict of interest. M.S. is the inventor on the patent application filed by University of Illinois at Chicago related to chimeric cell therapy for Duchenne muscular dystrophy (WO/2016/201182). The authors JC, AH, JG, EM and ES have no financial conflict of interest. University of Illinois at Chicago has approved the Nepotism Disclosure and Management Plan for MS and KS. The authors JC, AH, JG, EM and ES do not have any non-financial conflict of interest. Fusion of myoblast cells from a normal donor and a DMD-affected donor, produce results suggesting fusion induces restoration of function of the dystrophin–glycoprotein complex (DGC). Image credit: University of Illinois at Chicago.